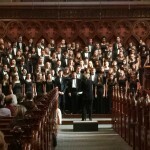 The Haverford Combined Choirs, comprised of Concert Chorale and Chamber Singers, have recently presented their most prestigious performance for the American Choral Directors Association Eastern Convention in Boston. They were selected by competitive recorded audition. Their twenty-five minute program was heard twice on Saturday, February 13 at 9:00am and 11:00am at the historic Old South Church, Boyleston Street in Boston’s Back Bay area. The group was selected from a huge pool of school and university choir submissions throughout the East Coast. Our choir was the only mixed voice, satb high school choir on the list.! The convention’s theme was Pushing Boundaries; The Haverford choirs did just that,offering a diverse program of a cappella repertoire from Renaissance to Contemporary vocal jazz. A detailed description of the event can be seen on http://acdaeast.org/boston/ Scroll down and we are seen on the list marked Auditioned Choirs.